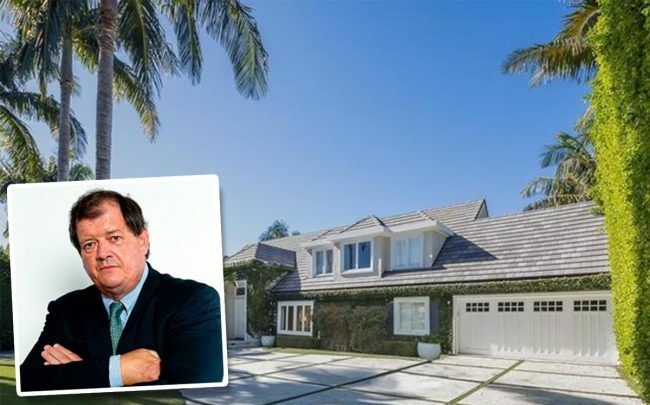 Paul Coulson, an Irish financier known as the “junk bond king,” unloaded his home in the Beverly Hills Flats for $10 million, The Real Deal has learned. That’s about $200,000 less than what he and his wife, Moya Coulson, paid for the home about four years ago. The buyers were Amy and Mark Kestenbaum, who acquired the property through a trust, records show. The deal closed late last month. Located on North Alta Drive, the Traditional style home includes six bedrooms and seven bathrooms. Amenities include a detached guest house, swimming pool, gym and marble-clad bathroom. Fred Bernstein and Ethan Peskowitz of Westside Estate Agency had the listing. Adi Werthman of Hilton & Hyland represented the buyer. Coulson is the billionaire founder of Ardagh Group, a Luxembourg-based packaging company. The businessman earned his nickname after raising almost $10 billion for Ardagh by selling junk bonds in six deals over two years, according to the Irish Times. Nearby, Casey Wasserman is shopping his newly built Foothill Estate for $97.5 million. Wasserman, grandson of legendary agent and studio executive Lew Wasserman, first listed the 18,500-square-foot mansion for $125 million last year.